Like you, probably, Bill and I thought that we lived in France. For the past 4 days however, it seems that we’ve slipped south of the border into Spain. For the last 10 years the city has held an increasingly popular music festival for 6 weeks during the summer that literally fills the air with sound from concerts that stretch from inside the walls of the castle to the banks of the river and canal. While the majority of those events are in French, lots of what we heard and saw this weekend had a distinct Spanish accent as the city celebrated La Feria. Given that we’re less than 2 hours by train from the border, it doesn’t surprise me that there is certainly a Spanish influence here that’s highlighted each year with this festival of music, dance, food, and drink from the country immediately south of here. Headquartered at the town square just opposite the train station and beside the Canal-du-Midi, the assemblage of 50 bodegas (bars, snack shops, restaurants, etc.) made sure that the multitudes gathered there every evening into the early morning hours for lively concerts never went hungry or thirsty. The city’s Facebook page https://fr-fr.facebook.com/VilledeCarcassonne/ has lots of great photos from each night. 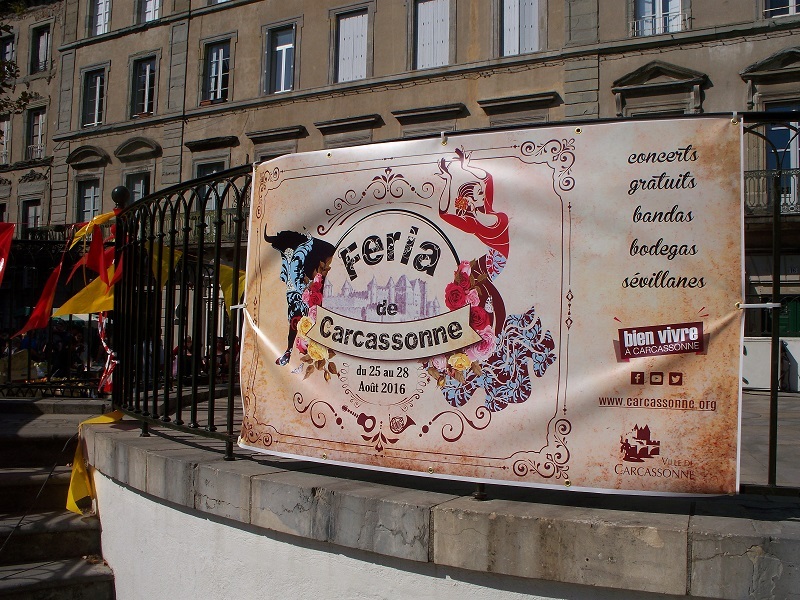 Businesses in town were part of the celebration as well with lots of shop windows displaying the distinctive red and white Feria de Carcassonne logo. Restaurants created special menus and banquet rooms were turned into dance halls for flamenco, salsa, and tango demonstrations.We went to a neighbor’s birthday party last night where even there the theme was obvious with a table full of tapas to start and a main course of paella served by a woman in a beautiful flowing red and black flamenco dress. Viva España! Posted on August 29, 2016, in Life in France and tagged Americans in Carcassonne, Carcassonne, Community, Life in France. Bookmark the permalink. 2 Comments. You’re making me wish I had spent more time in Carcassonne! What a lively, exciting town you have chosen to call “home!” I wish I were there too!